An overnight event on December 6, 2019 that brings together teamwork, technology, and competition. Each team must complete the registration form. Space will be limited, submit your form early to save your spot. Submission deadline is TBA. If you have any questions or need assistance, please contact Jim Delorie at deloriej@thomas.edu or 207-859-1183. 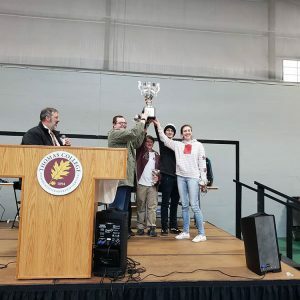 Open to high school and home-school students, the Thomas Cup will feature up to 30 teams competing for the top bragging rights in a number of technology competitions including cyber defense, gaming, computer science, and crime scene investigation (CSI) . The Thomas Cup will begin on at 6 PM on December 6th and continue throughout the night until approximately 10 AM. While the Thomas Cup is centered on technology, competitors will need more than just technical skills to succeed. The best teams will combine a mix of project management, innovation, creativity, teamwork, leadership, and more in order to overcome the challenges and defeat their opponents. No matter what interests and skills competitors bring to the table, they’ll enjoy a unique night of exciting challenges on the Thomas College campus, all at no cost.